A veteran of both the Franco-Prussian War and World War I in his old uniform as part of a veteran’s rally, Germany 1936. And this holds good not only for new phenomena in the cultural domain but also in politics. The more inferior new revolutionary movements are, the more will they try to denigrate the old forms. Here again the desire to pawn off their shoddy products as great and original achievements leads them into a blind hatred against everything which belongs to the past and which is superior to their own work. As long as the historical memory of Frederick the Great, for instance, still lives, Frederic Ebert can arouse only a problematic admiration. The relation of the hero of Sans Souci to the former republican of Bremen may be compared to that of the sun to the moon; for the moon can shine only after the direct rays of the sun have left the earth. Thus we can readily understand why it is that all the new moons in human history have hated the fixed stars. In the field of politics, if Fate should happen temporarily to place the ruling power in the hands of those nonentities they are not only eager to defile and revile the past but at the same time they will use all means to evade criticism of their own acts. The Law for the Protection of the Republic, which the new German State enacted, may be taken as one example of this truth. The saddest feature of the condition in which our whole civilization found itself before the War was the fact that it was not only barren of any creative force to produce its own works of art and civilization but that it hated, defiled and tried to efface the memory of the superior works produced in the past. About the end of the last century people were less interested in producing new significant works of their own–particularly in the fields of dramatic art and literature–than in defaming the best works of the past and in presenting them as inferior and antiquated. As if this period of disgraceful decadence had the slightest capacity to produce anything of superior quality! The efforts made to conceal the past from the eyes of the present afforded clear evidence of the fact that these apostles of the future acted from anevil intent. These symptoms should have made it clear to all that it was not a question of new, though wrong, cultural ideas but of a process which was undermining the very foundations of civilization. It threw the artistic feeling which had hitherto been quite sane into utter confusion, thus spiritually preparing the way for political Bolshevism. If the creative spirit of the Periclean age be manifested in the Parthenon, then the Bolshevist era is manifested through its cubist grimace. virtue of their education and position, ought to have felt themselves obliged to take up a firm stand against this outrage on our culture. But they refrained from offering serious resistance and surrendered to what they considered the inevitable. This abdication of theirs was due, however, to sheer funk lest the apostles of Bolshevist art might raise a rumpus; for those apostles always violently attacked everyone who was not ready to recognize them as the choice spirits of artistic creation, and they tried to strangle all opposition by saying that it was the product of philistine and backwater minds. People trembled in fear lest they might be accused by these yahoos and swindlers of lacking artistic appreciation, as if it would have been a disgrace not to be able to understand and appreciate the effusions of those mental degenerates or arrant rogues. Those cultural disciples, however, had a very simple way of presenting their own effusions as works of the highest quality. They offered incomprehensible and manifestly crazy productions to their amazed contemporaries as what they called ‘an inner experience’. Thus they forestalled all adverse criticism at very little cost indeed. Of course nobody ever doubted that there could have been inner experiences like that, but some doubt ought to have arisen as to whether or not there was any justification for exposing these hallucinations of psychopaths or criminals to the sane portion of human society. The works produced by a Moritz von Schwind or a Bocklin were also externalizations of an inner experience, but these were the experiences of divinely gifted artists and not of buffoons. There was no doubt in my mind. I went home and hung the beautiful banner completely across the living room wall. In the center I mounted a plaque of Adolf Hitler. Then I placed a small bookcase under it and set three candles to burning in front, to make a holy altar to Adolf Hitler. I closed the blinds, lit the candles, and stood before my new altar. For the first time since I had lost my Christian religion, I experienced the soul-thrilling upsurge of emotion which is denied to our modern, sterile, atheist “intellectuals” but which literally moved the Earth for countless centuries: religious experience. I stood there in the flickering candlelight, not a sound in the house, not a soul near me or aware of what I was doing—or caring. But as I looked at the stern face of the greatest mind in twenty centuries, I felt the unbelievable flood of “religious” power pouring into me, which would be easily understood by any savage Indian standing on a mountaintop at sunrise and communing with the Great Spirit before battle—but which the intellectuals have denied themselves because of their conceit that they can “know” everything. I was moved beyond the power of words to describe. Goose pimples rose all over me, my hair stood on end, my eyes filled with tears of love and gratitude for this greatest of all conquerors of human misery and shame, and my breath came in little gasps. If I had not known that the Leader would have scorned such adulation, I might have fallen to my knees in unashamed worship—but instead, I drew myself to attention, raised my arm in the eternal salute of the ancient Roman legions, and repeated the holy words, “HEIL HITLER!”—meaning every tiny syllable with all my heart and mind and soul. No longer was Adolf Hitler only a great mind to me. Now I realized the inscrutable power of the human soul. Now I knew why the power of that human soul for ten thousand years, again and again, has conquered the mightiest aggregates of physical force and tyranny, regardless of odds or possibilities! I had run the full circle from savage and childish animal instinct—the primitive stage of most of humanity—to conceited and sterile intellectualism— the state of our convinced Marxists and liberals—and finally I had, with the help of the Great Leader, found my way back to the natural understanding of the world given freely to every dog and worm and ape and man, of which the intellect is only a sort of recent development or “trick.” I had found my way to that unconscious understanding of eternal riddles which can only be called “widsom”—the same perception of the essence of things which has, in different guises, formed the basis of the teachings of all great leaders in all times. As the emotional storm subsided within me, it left me filled with a holy sense of MISSION, which is the fundamental weapon and armor of a revolutionary leader. Where before I had to fight the forces of tyranny and regression, now I HAD to fight them. But even more, I felt within me the POWER to prevail—strength beyond my own strength—the ability to do the right thing, even when I was personally over-whelmed by events. And that strength has not yet failed me. Nor will it fail. It is the Power beyond the atom, the Force called “religious” by the non-intellectual, “psychological self-hypnosis” by the “brains” of today, and the “Unknowable” by those who have learned true wisdom. I knew with calm certainty exactly what to do, and I knew, in a hard-to-explain sense, what was ahead. It was something like looking at a road from the air, after seeing only the curve ahead from the ground. The world was obviously building up to an unheard-of, unprecedented clash between the dark forces of massed ignorance, greed, envy, hate and stupidity—mustered and led by the scheming Jew—and the perishing forces of Nature’s elite—the White man. The Jew, with his Marxist democratic idea of the supremacy of mere numbers threatened to overwhelm the White man of the world, regardless of boundaries or political affiliations, by the sheer mass of the teeming colored and inferior masses, which outnumbered the white builders of civilization by more than 7 to 1. Adolf Hitler had shown the way to survival. It would be my task on this Earth to carry his ideas and his “laboratory example” to total, worldwide victory. I knew that I would not live to see the victory which I would make possible. But I would not die before I had made that victory certain. Dr Matthew Raphael Johnson looks at the persecution of Michael Karkoc for this week’s broadcast of The Orthodox Nationalist. Michael Karkoc is a 98 year old American citizen accused of “Nazi war crimes.” He has Alzheimers, yet he is being accused of “participating” in the suppression of the Warsaw uprising in July of 1944. While the Allied bombers destroyed civilian centers in Japan and Germany, the Polish government is arguing that the suppression of a riot is a crime. The main driving force behind this is not Jewish, but Attorney Robert Janicki, head of the Main Commission for the Prosecution of Crimes Against the Polish Nation. The Ukrainian Self Defense Legion was a part of the 14th Waffen Grenadier Division of the SS and was comprised of Ukrainian nationals from the western province of Galicia. It was created under the condition that it would “exclusively fight the Bolsheviks” and not the western Allies, including Poles. The 14th Combat SS division was not even in Poland at the time of the riots. They were in Slovenia. There is no confirmation or evidence of anything untoward, but media headlines have already convicted this man. The main purpose of joining the legion was to lay the military groundwork for national independence, something the SS opposed. According to Michael Melnyk’s (2007). To Battle: The Formation and History of the 14th Waffen-SS Grenadier Division, the history of the unit in July of 1944 shows them fighting off a massive Soviet attack from the Second Soviet Air Army and not in the least involved in pacifying local riots. They were instead, on the 21st of July, near the town of Olesko, up against a large number of Soviet tanks commanded by Marshal Ivan Konev. Most of its forces were destroyed in the fighting. Though a German Panzer counterattack rescued 400 Galicians from the town of Brody where they were dug in, the Soviets used their overwhelming numbers to destroy the unit by the 22nd. Yet, the Polish government wants to indict him for actions against civilians on the 23rd. The evidence does not add up. The Soviet 91st Independent Tank Brigade “Proskurov” destroyed the German parts of the division later on the 21st and total losses for the division in this period exceeded 30,000. There is not a shred of evidence that the SS-Galicia unit was used against these villages or was even used as a police force. Even if it were, they were fighting guerrilla partisans, not regular soldiers, according to Melnyk. Yet Robert Janicki claims 100% certainty of this old man’s guilt. The Center for Holocaust and Genocide studies calls him a “top commander” of the unit while also saying he was only a second lieutenant. This makes no sense at all, but as usual, truth does not seem to be the main reason for this. Listen to the broadcast by turning on the ANS Radio below. As of March 8 Canadian organizers of an international celebration of women in aviation where standing by their decision to honor the late Hanna Reitsch, who was the first woman to fly a helicopter — and,an unrepentant NSDAP member, but after pressure by a Jewish group there will be no mention of Hanna Reitsch after the mayor of Lachute announced Thursday his town wouldn’t allow the event to proceed if it glorified someone with a Nazi past. As many as 800 women and girls are expected to gather at a municipal airfield in Lachute, 80 kilometres northwest of Montreal, on Saturday for the Women of Aviation Worldwide (WOAW) event — just one of many events taking place across four continents. This year marks the 80th anniversary of Reitsch’s first helicopter flight, and as CBC first reported Wednesday, organizers planned to celebrate that accomplishment with videos of Reitsch in action and posters about her. Reitsch, who died in 1979, is remembered not only as a pioneering female pilot, but as a star of NSDAP propaganda. “Notoriously, she is remembered for very close connections to Adolf Hitler,” said Jean Allman, a professor of history at Washington University in St. Louis, who has written about Reitsch. Allman and other historians have described Reitsch as an “unrepentant” Nazi. In an interview on CBC’s Daybreak, Lachute Mayor Carl Péloquin said when the (((town))) heard about the event, they contacted the promoter and made it very clear they wanted no part in it. “We told them that we wouldn’t be accepting or tolerating any kind of events in relation with Nazism or any other kind of extremist movement,” he said. Saturday’s event is to take place at a municipal airport on municipal land. Péloquin said the city received a letter from the organizers guaranteeing there won’t be any mention or tribute to anyone linked to the Nazis. Marguerite Varin, the event organizer, wouldn’t comment on what discussions took place between herself and the city. She said simply that anyone who had questions about it were invited to attend and find out for themselves. She was the first female stunt pilot and test pilot in aviation history. Born into a middle class German family in an area now part of Poland, her father was an ophthalmologist and her mother a homemaker with a simple belief in God. Hanna’s early goals were to be a flying doctor, but her passion for flying soon overtook her desire for a career in medicine and she left medical school to become a full time glider pilot. Because of the 1919 Treaty of Versailles, Germany was not allowed to build powered aircraft, so Hanna learned to fly gliders. In the 1920s, she went on to become an instructor in glider pilot school, but quickly distinguished herself as a pilot and got jobs in German government films as a stunt pilot. Because she was the first female helicopter pilot and first human to ever fly a helicopter indoors, this attracted the attention of the Third Reich and the Luftwaffe. In 1940, the British Balloon Barrage had taken a number of fatalities on German pilots; the barrage balloon was deadly in that it could be flown at heights of 10,000 feet and the cable on which it was attached was very hard to spot when flying. The barrage balloon was a brilliantly simple idea and it was thought that there might be a way to use a simple technology to cut through the cables. Hitler was invited to see the testing of this new device. During the testing of devices to shear the cables, a snapped cable tore through the ends of her propeller and yanked the engine from her aircraft. Reitsch skillfully landed the crippled plane and in 1941 she was awarded the Iron Cross, First Class by Hitler for her bravery and skill. She was the first woman and ONLY woman to ever be awarded the Iron Cross during World War II, and the Luftwaffe diamond clasp, becoming a heroine of the Third Reich. Because of her fame, she was able to develop a close relationship with Hitler. During the war the Luftwaffe employed Reitsch to test a variety of planes, gliders, and flying bombs. Reitsch was fiercely patriotic and an ardent supporter of Hitler, and believed in Hitler’s grandiose plans for the Third Reich. In the last days of the war, Reitsch was asked to fly her lover, General Robert Ritter von Greim, into Russian Army surrounded Berlin to meet with Hitler, and to try to persuade Hitler to fly with her to German controlled territory to carry on the war. Hitler refused to leave Berlin. So when she expressed her desire to die with Hitler in his Bunker, Hitler refused her request and ordered her to fly out of Berlin. After the war she was doggedly unrepentant about her support for Hitler and the NSDAP. 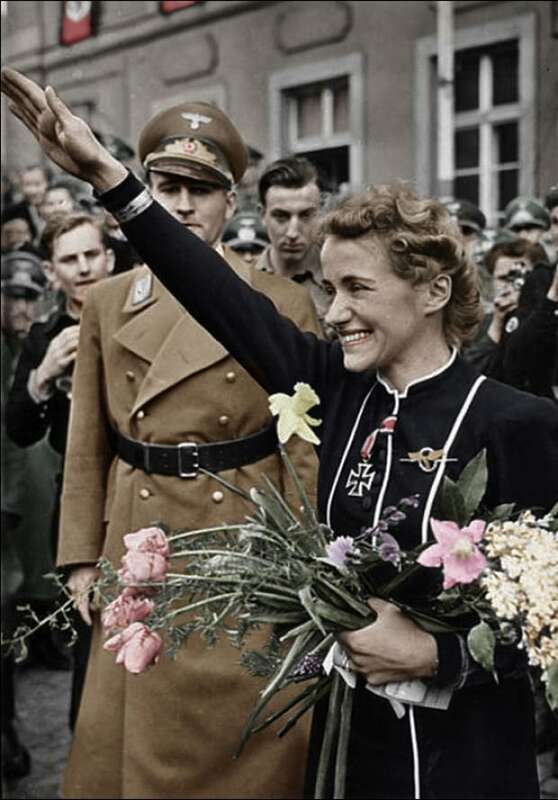 She wore her Iron Crosses proudly and wrote a somewhat defensive and self-serving memoir, “Fliegen, mein Leben” (1951), which was translated in 1954 as “Flying is My Life.” In this book she presents herself as a patriot, and makes no moral judgments about Hitler and Germany. ” Hanna Reitsch was interviewed and photographed several times in the early 1970s in Germany by US investigative photojournalist Ron Laytner. At the end of her last interview she told Laytner: “And what have we now in Germany? A land of bankers and carmakers. Even our great army has gone soft. Soldiers wear beards and question orders. I am not ashamed to say I believed in National Socialism. I still wear the Iron Cross with diamonds that Hitler gave me. But today in all Germany you can’t find a single person who voted Adolf Hitler into power.” Then she uttered the words that many feel kept her out of the history books: “Many Germans feel guilty about the war. But they don’t explain the real guilt we share – that we lost.” She spent her remaining post war years as an outcast. She spent her last years quietly in Ghana as an instructor in a flying school that she helped establish. Two years before she died, at 65 years of age she set a new women’s distance record in a glider. Hanna Reitsch died quietly in bed of a massive heart attack at age 67 in Frankfurt, Germany one year after setting a new women’s distance record in a glider. (2) One torments an animal when one repeatedly or continuously causes appreciable pain or suffering; the torment is unnecessary in so far as it does not serve any rational, justifiable purpose. One mishandles an animal when one causes it appreciable pain; mishandling is rough when it corresponds to an unfeeling state of mind. to tear out or separate the thighs of living frogs. The importation of horses with shortened tails is forbidden. The minister of the Interior can make exceptions if special circumstances warrant it. The temporary use of hoofed animals as carriers in the mines is only permitted with the permission of the responsible authorities. It is forbidden to operate on or handle living animals in ways that may cause appreciable pain or damage for the purpose of experiments, to the extent the provisions of #6 through #8 do not mandate otherwise. (1) The minister of the Interior can at the proposal of the responsible government or local authorities confer permission on certain scientifically led institutes or laboratories to undertake scientific experiments on living animals, when the director of the experiment has sufficient professional education and reliability, sufficient facilities for the undertaking of animal experiments are available, and guarantee for the care and maintenance of the animals for experiment has been made. (2) The minister of the Interior can delegate the granting of permission to others among the highest officials of the government. (3) Permission may be withdrawn without compensation at any time. The experiments may only be carried out under the complete authority of the scientific director or of a representative that has been specifically appointed by the scientific director. The experiments may only be carried out by someone who has previously received scientific education or under the direction of such a person, and when every pain is avoided in so far as that is compatible with the goal of the experiment. Experiments for research may only be undertaken when a specific result is expected that has not been previously confirmed by science or if the experi­ments help to answer previously unsolved problems. The experiments are only to be undertaken under anesthesia, provided the judgment of the scientific director does not categorically exclude this or if the pain connected with the operation is outweighed by the damage to the con­dition of the experimental animals as a result of anesthesia. Nothing more severe than a difficult operation or painful but unbloody experiment may be carried out on such an unanesthetized animal. Animals that suffer appreciable pain after the completion of such a difficult experiment, especially involving an operation, are, in so far as this is, in the judgment of the scientific director, compatible with the goal of the experiment, immediately to be put to death. Experiments on horses, dogs, cats, and apes can only be carried out when the intended goal may not be achieved through experiments on other animals. No more animals may be used than are necessary to-resolve the associated question. Animal experiments for pedagogical purposes are only permitted when other educational tools such as pictures, models, taxonomy, and film are not suf­ficient. Records are to be kept of the sort of animal used, the purpose, the procedure, and the result of the experiment. Experiments on animals for judicial purposes as well as inoculations and taking of blood from living animals for the purpose of diagnosing illness of people or animals, or for obtainment of serums or inoculations according to procedures that have already been tried or are recognized by the state, are not subject to provisions #5 through #7. These animals, however, are also to be killed pain­lessly if they suffer appreciable pain and if it is compatible with the goals of the experiment. (1) Whoever unnecessarily torments or roughly mishandles an animal will be punished by up to two years in prison, with a fine, or with both these penalties. (2) Whoever, apart from the case in (1), undertakes an experiment on living animals (# S) without the required permission will be punished by imprisonment of up to six months, with a fine, or with both of these penalties. 4. neglects to prevent children or other persons that are under his/her supervision or belong to his/her household from violating the provisions of this law. (1) In addition to the punishments in #9 for an intentional violation of the law, an animal belonging to the condemned may be confiscated or killed. Instead of confiscation it may be ordered that the animal be sheltered and fed for up to nine months at the cost of the guilty party. (2) If no specific person can be identified or condemned, the confiscation or killing of an animal may be undertaken in any case when the other prerequisites are present. (1) If someone is repeatedly guilty of intentionally violating the provisions that are punishable according to #9 the local authorities that are responsible can prohibit that person from keeping certain animals or from business involving them either for a specified period or permanently. (2) After a year has passed since the imposition of the punishment the re­sponsible local authorities may rescind their decision. (3) An animal subject to appreciable negligence in provision, care, or shelter may be taken away from the owner by the responsible local authority and ac­commodated elsewhere until there is a guarantee that the animal will be cared for in a manner above reproach. The cost of this accommodation shall be paid by the guilty party. If in a judicial process it appears doubtful whether an act violates a prohibition of #1, (1) or (2), a veterinarian shall be summoned as early in the process as possible and, in so far as it concerns a farm, an agricultural official of the gov­ernment shall be heard. Anesthesia as it is understood in this law means all procedures that lead to general painlessness or eliminate localized pain. The Minister of the Interior can issue judicial and administrative decrees for the completion and enforcement of this law. In so far as the Minister of the Interior does not make use of this power, local governments can make the necessary decree for implementation. This law becomes binding on February 1, 1934 with the exception of #2, (8) and #3, (11), for which the Minister of the Interior must see the time of imple­mentation in consultation with the Minister of Food and Agriculture. The laws #1456 and #360, (13) of the law of May 30, 1908 remain unchanged.